Have you ever read a book so beautifully written that you had to wonder if it was truly prose and not poetry? A story so brilliantly crafted you knew no words of your own could adequately capture it? That is how I feel after reading In the King's Arms by Sonia Taitz. I had read great things about the book on Twitter and when Lucinda of Lucinda Literary offered to have a copy sent to me, I jumped at the chance. I've read numerous books about World World II, especially when historical fiction was the top of my reading choices. However, those following my blog know that I've been enjoying stories that are set shortly after the war ended or focused on other players during the era. In the King's Arms fit into this new area I've been exploring. The story is about a young woman who is the daughter of Holocaust survivors. I can't imagine how such an event could shape the lives of the next generation. 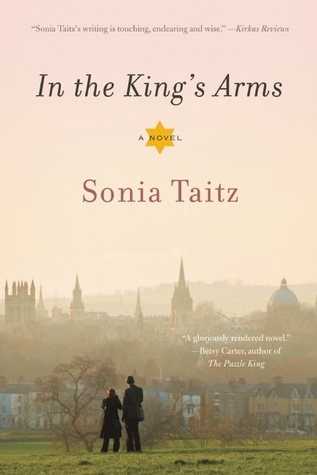 When I first started reading In the King's Arms, I was reminded of A Separate Peace by John Knowles. I loved that story when I was in high school, read the sequel, and even used it for a term paper topic. I've been trying to figure out why I wanted to compare them. I think it was because both are "coming of age" stories, but there is more than just that. Maybe it had something to do with how it was written. I'm not sure, but something about the story touched me. I feel so completely inadequate to review this book. It is beautiful and I can totally see why The Sunday Book Review choose it for inclusion. A free book was obtained from the source mentioned above in order to provide an honest and free review. Girl Who Reads is an advertising affiliate with Amazon and IndieBound; a small fee is earned when purchases are made using the above links. I usually don't go for historical fiction, but you've got me intrigued about this one.